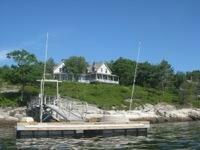 We moored at Five Islands on the evening of 6/29, and hunkered down for an impending thunderstorm. The mooring, as we learned from Active Captain notes, is provided by the Five Islands local yacht club free of charge and available for a two nights’ stay. Thanks, YC! We prepared dinner and as it turns out that impending thunderstorm blew right over and didn’t even leave a drop of rain. The next morning a seal greeted us as we ate breakfast on deck. After breakfast we took the kayaks for another spin on quite a long paddle around Macmahan Island. From our mooring we paddled up the Little Sheepscot River, through the Goose Rock Passage, and back down the Sheepscot River. We saw several beautiful houses topping the hills. I chose this one to be our future summer home. Ospreys circled overhead; there were at least six and several times we saw them carrying sticks back to build into their nests. 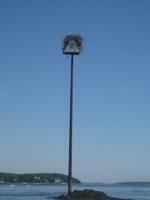 Below is an osprey nest. We saw some little heads poking out from below. 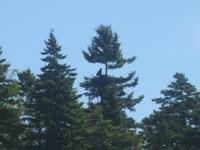 Local passers by on a motor boat pointed out the eagle nest to us. The night before we were able to glimpse the male bald eagle in flight over our mooring. Time for lunch! We secured the kayaks back on deck and took the dinghy over to shore. We brought along our diesel tanks to be refilled at the fuel dock. 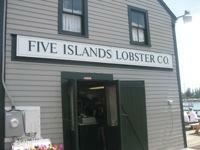 The Five Islands Lobster Co. provided delicious eats! 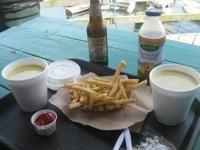 Haddock chowder, fries, and COLD drinks filled our bellies so that we didn’t even have room for Annabelle’s Ice Cream, which neighbored the snack shack. We paddled the dinghy back to Rode Trip, all fueled and ready to go. Brian was hoisted up the mast to secure a light on the spreader that had been knocked loose courtesy of the Sheepscot River knocking us around the day prior. We decided to motor out to catch the last of the outgoing tide, low tide at 1400, and headed toward Linekin Bay.